Explore beautiful venues throughout the Empire State, along with top-notch local vendors to help you plan your big day. Saratoga Springs, NY, is nationally recognized as one of America’s great destinations—featuring naturally carbonated mineral springs, horse racing, golf courses, restaurants, a vibrant downtown and historic museums. The Spa City boasts an eclectic list of upscale hotels, inns, and bed & breakfasts that offer superior wedding venues in a dynamic Victorian City setting. Some might say it’s the ultimate day of transformation. And in the days after, you might forget your last name has changed, but one thing won't be forgotten—what you shared and where you shared it. Gideon Putnam’s Wedding Bliss package is a totally unique experience for your wedding party because it is designed by you. Contact them directly for information, details and pricing. Visualize your wedding in lush surroundings, scented with sweet aroma and the beauty of a stunning vineyard estate as the backdrop. Nestled in the heart of Long Island’s North Fork Wine Country, The Vineyards offers a unique and unforgettable experience for an intimate, private setting that’s exclusively yours. 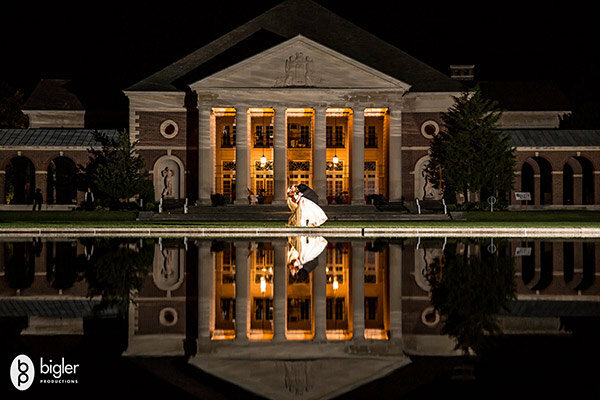 Create a memorable downtown Saratoga Springs wedding at the beautiful Excelsior Springs Ballroom. Celebrate under breathtaking chandeliers and allow the award-winning executive chef to tantalize the taste buds of your guests. Excelsior Springs is adjacent to the Courtyard Marriott, which offers oversized luxury suites perfect for wedding parties, a lively hotel bar and a terrace for your post-wedding brunch. From an inviting porch, to a fanciful Victorian gazebo, Anne's Washington Inn is the perfect setting for a wedding celebration. Surrounded by Saratoga Spa State Park, the inn has the graciousness of a country house with city ease. The warm elegant dining room, enhanced with classic columns and chandeliers, provides an ideal ambiance for dinners, receptions, and brunches. When accompanied by a tent on the front lawn, your wedding becomes a fairy tale event. Invite your friends and family to stay overnight in 18 thoughtfully appointed guest rooms. Spend your honeymoon in charming Saratoga Springs where there are many historic sites, excellent restaurants, unique shops, and entertainment. Mazzone Hospitality offers truly creative full-service catering in Upstate New York, with over 30 years of experience delivering flawless and memorable weddings, social events and galas in Albany, Saratoga, and beyond. With gourmet food prepared to your taste, impeccable service and the flexibility to host your event anywhere in New York, Mazzone Hospitality ensures that your special day exceeds your expectations. Situated on 26 acres with breathtaking views of the Hudson River, Tarrytown House Estate accommodates guests throughout historic stately mansions, glorious gardens and a modern hotel with over 200 rooms, and features a seasoned professional staff. Choose from exquisite locations for indoor and outdoor ceremonies, charming ballrooms and residence-style reception spaces, and additional options for pre- and post-wedding events including rehearsal dinners and breakfast with guests. Exclusive wedding packages are tailored for events filled with grandeur and royalty. From the Estate Wedding to the Grand Duke Wedding, the Tarrytown House Estate staff is determined to meet every extravagant detail to match this timeless setting. Exchange vows and celebrate with a sumptuous dinner amid sun-drenched stained-glass windows and the classic 40-foot vaulted ceiling of the Great Hall, or surrounded by the lush landscaped grounds overlooking Westchester County. Surrounded by manicured gardens and sweeping hilltop views of the Hudson River only 30 minutes from Manhattan, Castle Hotel & Spa sets the scene for sophisticated and memorable weddings. Castle Hotel & Spa features 31 recently renovated guest rooms and suites reflecting a renewed luxury and sophistication. When the minimum guarantee is met, the bridal couple is offered a complimentary stay the night of the wedding. Celebrate yourself, and others will follow! Choose from exciting bridal designers such as collections, Provonias, Yumi Katsura, Cristiano Lucci, Robert Bullock, and more when you visit Designer Loft. Designer Loft carries gowns for mother of the bride, bridesmaids and flower girls; as well as accessories including veils, shrugs, jewelry and headpieces. Designer Loft is a full-service salon that will handle all alterations, including custom gowns and add-ons, all done on premises.